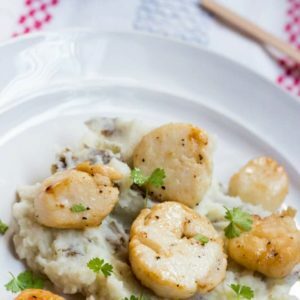 This recipe is 7 Freestyle points per serving, about 4 scallops and 1 cup mashed potatoes. In a large pot, heat at least 8 cups of water to boiling. Once it's boiling, add the potatoes and cook until the potatoes are tender and cooked through, about 10 minutes. Drain the water into a strainer. Using the same pot, add the drained potatoes back in and mash them. Add the garlic salt, garlic, Almond milk and half and half. Mix together and stir to make them soft. Meanwhile, in a cast iron skillet, heat the avocado oil over medium heat. Once it's hot, add the onions and scallops to the skillet. Sprinkle them with salt and pepper. Saute these for 8-10 minutes turning until golden brown on both sides. Serve 4 scallops with 1 cup of mashed potatoes.